The region of Palaiokastritsa is located on the North West part of the island of Corfu (Kerkyra) and approximately 25km from Corfu Town. 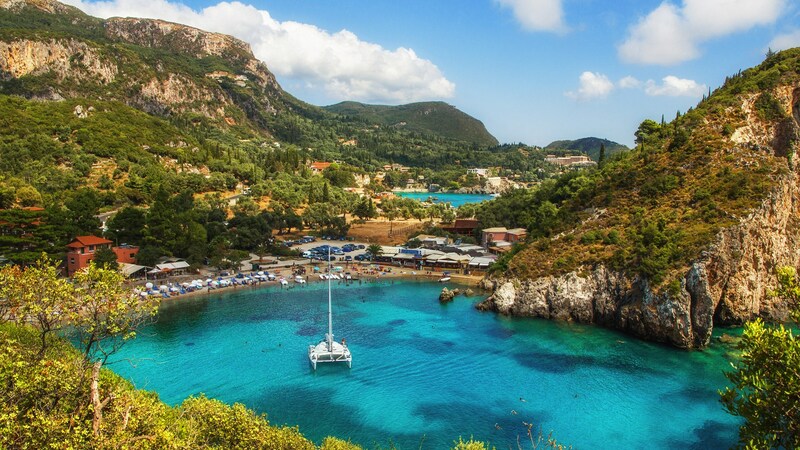 Palaiokastritsa is probably the most popular area of the island as the most beautiful villages of Corfu are found there. There are six small sand and pebbled bays (Agia Triada, Agios Spyridon, Platakia, Alypa, Agios Petros and Ampelaki) in Palaiokastritsa which are surrounded by olive tree forests. The famous organized resort is well known for its natural beauty and also for its deep turquoise crystal clear waters, an ideal destination for diving lovers. Ampelaki Bay was the first diving centre created in Europe, aged back to 1963 and until today it is one of the best for underwater explorations in Greece and beyond. The area of Palaiokastritsa will surely reward you for your choice and before you leave make sure to explore the numerous sea caves by boat!